I couldn’t help but laugh when I saw the name of this second-hand / vintage book shop in Talbot (see right hand side of roof) and I’m guessing there’s no coincidence about the relationship with the name of the street of which it’s on the corner. 🙂 nice one guys! 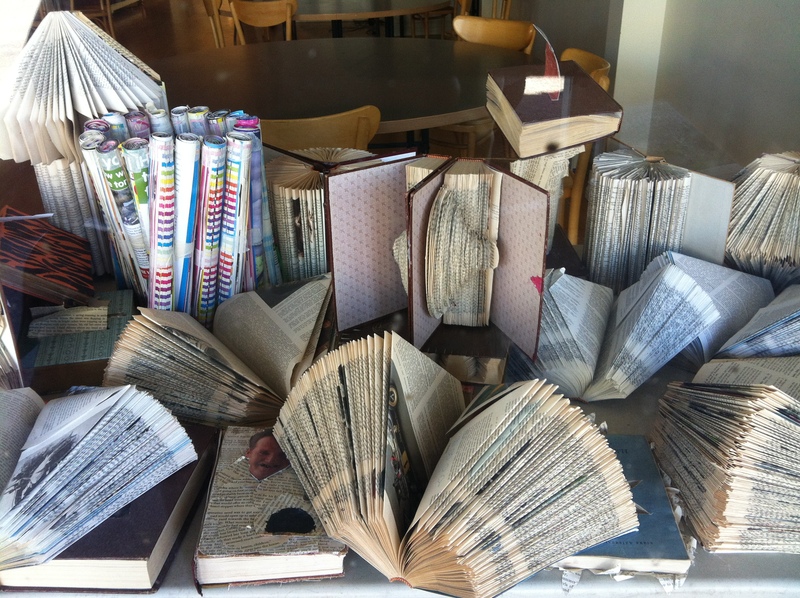 This book art in the window of a cafe in Clunes just fascinated me! It’s probably a good thing it was Sunday and the cafe was closed, or I probably would have wondered in there for a closer look and then felt obliged to buy something I couldn’t afford and didn’t need! 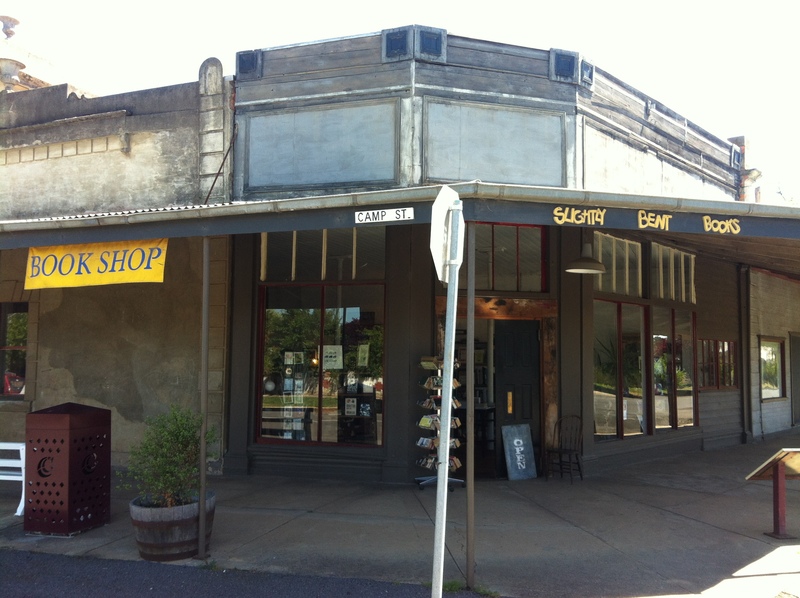 Clunes is alternatively known as “Booktown” and hosts an annual huge writers and readers festival that I think requires closer investigation when the next one comes around. Hopefully by then I’ll be able to afford to stay somewhere nicer than a site in the caravan park (which wasn’t horrible, but very ordinary in terms of the facilities offered). Ladies and Gentlemen, I present to you the Maryborough Train Station. Where I hear you ask??? But exactly! I am constantly amazed at the extraordinary Victorian (era, not State) architecture in this state. Of course it makes sense, given that most of these towns owe their existence to the mid – late 18th century gold rushes that made Victoria what it is, and there was a hell of a lot of money around at that time. A bit like Coolgardie/Kalgoorlie I guess, but there’s so much more of it here to marvel at. 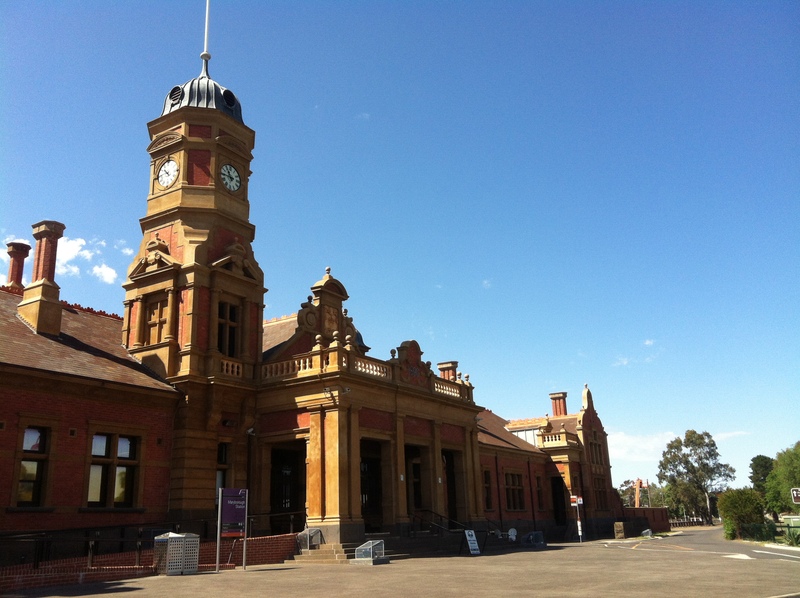 Don’t you overlook that Maryborough station, if you take an interest in governmental curiosities. Why, you can put the whole population of Maryborough into it, and give them a sofa apiece, and have room for more. You haven’t fifteen stations in America that are as big, and you probably haven’t five that are half as fine. Why, it’s perfectly elegant. And the clock! Everybody will show you the clock. There isn’t a station in Europe that’s got such a clock. It doesn’t strike–and that’s one mercy. It hasn’t any bell; and as you’ll have cause to remember, if you keep your reason, all Australia is simply bedamned with bells. I still find it fascinating though that these buildings have been so well preserved, and continue to be used – they often look a little out of place in their current communities though. Like the grand town halls I stumbled across whenever I wondered through suburban Melbourne earlier this year, which I suspect must once have had considerable grounds around them – their scale wouldn’t make sense otherwise – but now are crowded by house and shops. Anyway, Maryborough today is a small city of around 7,500 people and I wouldn’t be surprised if you still fit all those folk in the station building (if you cleared out the massive antiques shop that now takes up half of it). Maryborough also boasts a fantastic historic precinct focused around McLandress Square that consists of a magnificent and shiny-white post office, court house and town hall – all still in use for their original purposes. Just stunning!